A friend of mine pointed out that Glenn Beck is apparently now speculating on the demise of the Kingdom of Jordan. I didn’t bother to confirm if Beck said anything about it or not. Why? Because my blood pressure goes way up whenever I read/listen to him, especially about the Middle East. He serves up some of the best ignorant fear-mongering around when it comes to this part of the world. MommaBean recently blogged about this and also gave her strong opinion about people back home peppering her with their opinions on her sanity due to her choice to remain here in the Middle East in the midst of growing (read non-existent in Jordan) “turmoil”. As always … a memorable read! Also, if you are looking for a well-thought out local perspective on the recent government reorganizing here in Jordan, take a look at the Black Iris of Jordan. Also, over here, you can see some pics of a recent peaceful solidarity rally held here in Jordan outside of the Egyptian embassy in support of the protests in Egypt. All you readers in America – I know you have plenty of time to surf the web today, what with Snowmeggedon on your doorstep. Take a minute to check out these other bloggers from Jordan. Check out the Festival of Alternative Arts! Special Note: Tonight (Tuesday, January 25th) there is a debate on life in Gaza being held as part of the Festival. It will be held from 5 PM to 7 PM at the Al-Balad Theater on the route down from Rainbow street in Jabal Amman to the balad. More info here. Unfortunately I can’t make it because of work. Hopefully someone else can! I recently had the privilege of attending a film screening of Swiss filmmaker Nicolas Wadimoff’s “Aisheen: Still Alive in Gaza“. The documentary observes several slices of life in Gaza after the devastating January 2009 Israeli offensive that left 13 Israelis and over 1300 Palestinians dead. The film provided little commentary on the events, but simply showed people in their everyday contexts trying to put their lives back together after a month of bombardment and destruction. I am preparing another post on my thought on the film, but wanted to point out that it is part of a larger event now being held here in Jordan. to showcase and discuss graffiti and other urban alternative art expressions. It aims at contributing to broadening the concept of art as a diverse form of expression, but also hopes to attract and stimulate an interest in urban art – in its different representations – among the large young population in Jordan. Don't sit at home - attend a festival event! The centerpiece of the festival is the photo exhibit “Gaza Grafitti” opening at the Jordan National Gallery of Fine Arts on January 26th (tomorrow) and running through February 15th, 2011. The exhibit is the work of Swedish photographer Mia Grondahl and is comprised of 60 photographs of grafitti art in Gaza over of seven year period (2002-2009). I am personally very interested in seeing this exhibit as I spent the summers of 1997 and 1998 in Gaza. At that time I was also fascinated by all of the graffiti I saw. Some of it obviously slogans of one sort or another, but also actual artwork. The art that I saw in the late 90s took the form of paintings of scenes in some cases, but also amazing Arabic calligraphy. As in parts of the West Bank where Palestinian artists have used the “security” wall as a canvas, graffiti has served as both an artistic and political release valve for an oppressed people. I am interested to see what Grondahl observed and recorded during her times in Gaza. I will probably go see the exhibit sometime in February. If you are here and Jordan and want to go together drop me a line. 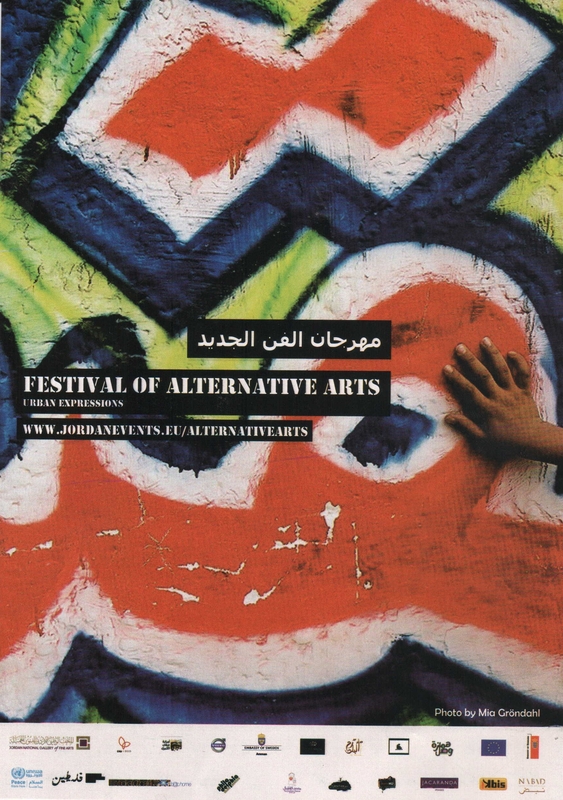 The Festival of Alternative Arts includes a number of other events in addition to the “Gaza Graffiti” exhibit. A complete list can be found on their Facebook events page. Dream Hiding Places at The Children’s Museum until January 31, 2011. 20 Palestinian children will be participating in a graffiti art workshop facilitated by a local graffiti artist. The artwork produced will be on display at the museum. Images/Suwar in Zarqa until January 30th. 28 Iraqi youths, refugees living in Jordan, tell their stories through use of the performing and media arts. The location in Zarqa is not clear from the FB page. Anyone have any idea? Refugee Camp Graffiti Art Project on display at Nabad Gallery from February 27th to March 1st. Workshops will be held with youth in three Palestinian refugee camps here in Jordan. They will be given cameras to photograph the graffiti they see every day. Then they will develop their own art. The results will be displayed in Baqa’a camp and the Nabad Gallery. If you happen to be in Jordan reading this, I hope you take a moment to attend one of these or other events associated with the festival. If you’re not in Jordan – just see what you’re missing! I’ll try to post on anything I get to attend. PS – I found out about this event through my new favorite resource – Jordan Events on Facebook. For those of you who are Facebook users in Jordan it’s a great way to find out what’s going on around the Kingdom! More details on this and other ways to help can be found over at Black Iris or at 7iber. His full account (and others) can be found at electronic intifada. According to the Israeli military this assault is far from over. In it’s fourth day the attacks have claimed the lives of at least 360 Palestinians (39 children) and injured over 1,600. Hamas rocket fire has accounted for 4 Israeli deaths in the same time period. Defense Minister Ehud Barak described the operation as “all-out war” and a Deputy Defense minister said that the operation could last for weeks. Ground troops are prepared to be sent in (article here). If you are able to donate some food or clothes or blood that would be great! If not, please continue to pray for peace. Prayer is not a last resort, but the foundation for any lasting peace! I’ve been trying to stick to updating once every Friday – but today I saw two articles on another blog that absolutely had to be posted ASAP. I cannot believe the insanity of both of these items! The Hebrew term “shoah” that is used here is almost exclusively reserved for discussing the Nazi’s genocide of European Jews during World War II. In Israeli/Jewish circles it is extremely unpopular for the term to be used of any current events, even though it does have the literal meaning of “disaster” This statement made some diplomatic shockwaves and there seems to have been some official backpedaling. In his blog post Liam Bailey even notes that the Yahoo! 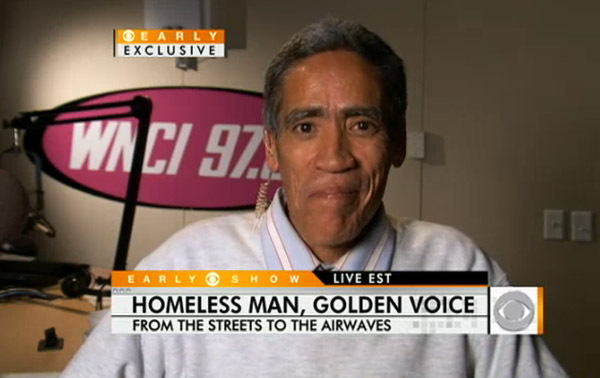 News article that he originally found this information in was re-worded later in the day. His full take on the situation is linked to here – please take a moment to read it. Liam Bailey also posts an important behind-the-scenes report of a Gazan family who lost their 6-month old baby to a shrapnel wound to the head during an Israeli airstrike on the Department of the Interior headquarters in Gaza. The young family lived across the street and became “collateral damage” in this sickening conflict. The mother had just finished nursing her baby when the missile slammed into the building across the street causing damage in the neighborhood and tragically destroying this young life. Click here to see Liam’s article including a YouTube video of al-Jazeerah’s reporting. (Be warned the footage shows the dead infant). BTW this happened Wednesday night. Did anyone hear about it in the news? I am deeply saddened by this report and hope you will join me in praying for peace in Gaza and especially for this family. Some of you may have noticed the casualty statistics that I have posted recently. For the most part those come from B’Tselem (The Israeli Information Center for Human Rights). Where possible I try to cross-check, but I trust this organization and the information they put out. Formed by concerned Israeli citizens (including attorneys, professors, and Knesset members) back in 1989, this organization investigates and reports upon human rights violations in the Occupied Territories. This includes human rights violations perpetrated by either side of the conflict. You might be interested in knowing that the name “B’Tselem” is from the Hebrew for “in the image of” and their website reports that the inspiration for this name comes from Genesis 1:27 that says that God created humanity in his image. This group of concerned Israeli citizens provides vital behind-the-scenes info that is not often heard above the clamor of the major news headlines. I find that their collection of short videos is particularly helpful in getting a quick snapshot of various human rights issues that do not get covered by the major networks. Here is a 3-minute video about the forced eviction/destruction of a village near Hebron that was located between the official border between with Israel and the “Separation Barrier” that is being built well inside Palestinian territory. B’Tselem expressed its grave concern following the renewed fighting in Gaza. During the first 2 months of 2008, Israeli security forces killed 146 Palestinians. At least 42 did not participate in the fighting when killed, and 11 were minors. Palestinians killed 2 Israeli civilians, and one member of the Israeli security forces. On 14 February 2008, Fawaziyeh a-Dark suffered a heart attack. Soldiers at a flying checkpoint prevented the passage of the ambulance summoned for her. When her husband tried to take her by taxi, soldiers at another checkpoint blocked their passage. He was forced to take her home, by which time she died. Please check their website from time to time. 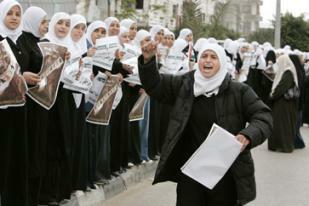 Please Note: This post is about the protests held in Gaza in Feb 2008. For thoughts on what is happening in Gaza in early 2009 check this post (here) and keep checking back on my main page (here). It is interesting/disturbing to note how in a year things went from bad to worse. Organizers in Gaza called for a massive non-violent protest today (Monday, Feb 25th, 2008), hoping for 1 person/yard from Erez Crossing in the north to Rafah in the south. Over this stretch of about 25 miles that would amount to aproximately 40,000 people. News reports from Reuters, the New York Times, Al-Jazeera, and Ha’aretz (Ha’aretz 1, Ha’aretz 2) put the actual number of protesters closer to 5,000. I link to 5 different articles here from prominent American, Arab, Israeli, and British news sources because I’ve learned over time that each one will have a piece of the story, and it’s almost always necessary to read a few articles to get a broader perspective. The protest was in reaction to the Israeli blockade of Gaza (preventing all but basic humanitarian aid to be let in – and even that was cut off for a few days prior to the Egyptian border incident). The nonviolent protest was called by an organization that backs the elected Hamas government. The Israeli government said they would not rule out the use of deadly force if protesters were to storm the border as they did at the Egyptian border last month, further stating that Hamas would be responsible for anyone hurt by Israel defending its borders. 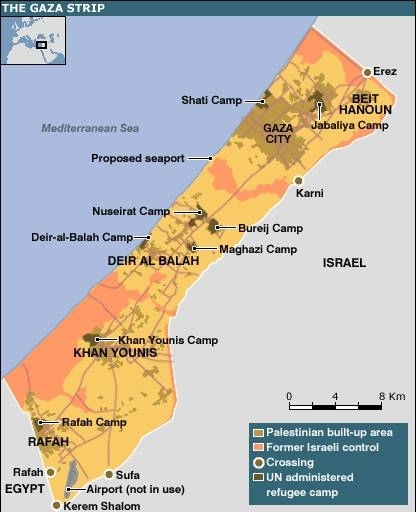 The nonviolent protest was actually two protests – about 3,000 in Beit Hanoun, a village in northern Gaza (aprox 6 km from the Erez border) and a group of 2,000 who marched towards Erez. This second group was turned back by the Hamas police before reaching Erez. During the the protest a non-related group fired a couple of Qassam rockets into Israel injuring 3, including two children. This weekend strikes by the Israeli Air Force were responsible for 3 deaths Beit Hanoun (the same village where Monday’s nonviolent protest took place). Gazans say the dead were civilians but the Israeli military says they were men preparing to make a rocket attack. The Gaza Strip is a powder keg waiting to explode. For the past half century it’s inhabitants have been subject to the whims of those who would seek to control the region (Europe, the UN, Arab nations, Israel, etc.). As a result they have been powerless to determine the course of their own futures. All entry and exit from the territory is controlled by Israel. Since 2000, travel outside of the territory by Palestinians has been severely restricted. All trade with Gaza must go through Israeli ports and are subject to Israeli tariffs and restrictions. Early this year Israel completely blockaded the territory not allowing any goods in or out, including fuel or basic humanitarian aid. So I ask, what would you do? What did our American forefathers do when faced with what they considered to be oppressive British taxation standards with no say in the process. I believe that it is only poverty and the overwhelming military mismatch between Palestine and Israel that has kept Palestinians from a full-fledged military revolt. I also believe that nonviolent protest is a very good answer to the dilemmas that face the Palestinian people. The world listens when the oppressed put down their weapons and hold up their open hands in protest. Think Gandhi, Martin Luther King Jr., Nelseon Mandela, the Burmese priests, etc. I wonder how the world would react if 40,000 protesters had shown up in the streets of Gaza today? The violence on both sides of the divide is deplorable and largely avoidable. There is no excuse for Palestine to be firing Qassam rockets into Israel. There is no excuse for the Israeli Air Force making air strikes in Palestinian neighborhoods. Ostensibly chasing down Palestinian militants, the amount of innocent bystanders who have been killed in such actions is well documented and unacceptable. In this morbid trading of casualty statistics as a mean of justifications for further violence there are no winners. However, I bristle when news or government reports link things like the rocket attacks with the nonviolent protests occurring at the same time. Its like condemning Martin Luther King for Black Panther violence. And if one really wants to examine the stats they do not look good for the Israelis. The New York Times article linked above noted that the Qassam rocket attacks have resulted in 13 Israeli deaths since 2001. On the other hand Israel has killed 290 Palestinians in 2007 alone. 96 of those deaths were civilians. In one year they’ve killed 7x as many as Palestinian rockets have in seven years. I’d rather condemn all violence, but if we must engage in this morbid numbers game who seems to be more in need of a secure border? When violence flairs up in Gaza or when they protest, what do we expect? If you or I were Palestinians what would we do? What would we do when an Israeli helicopter or jet flies over firing missiles into our neighbors houses? What would we do when IDF actions happen under cover of night in our streets? What would we do when our borders are closed and we cannot receive vital goods and services? What would we do when we seem to be the pawn of inaccessible governments on both sides? Try to blow ourselves up? Shoot inaccurate and ineffective missiles? Throw stones in frustration? Sign a petition and attend a sit-in? As Americans what would we do if we were faced with these conditions? Call our congressperson? Lobby Capital Hill for our freedoms? Start a revolution? I applaud the Palestinians for their nonviolent protest today and am hopeful for more (larger) protests in the future. But realistically, I expect this situation is far more likely to explode into a violent confrontation. I’m not sure where history will place the finger of blame, but I have a sickening feeling in my gut that it will not point only at Palestinians or Israelis.